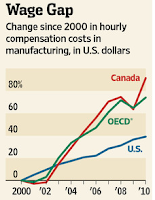 US manufacturers should soon have an edge when competing globally. 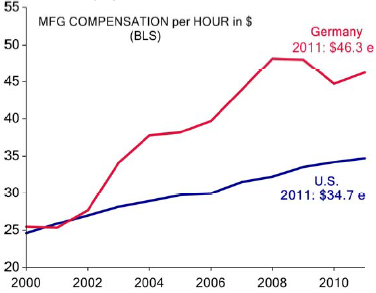 The main reason is that manufacturing labor costs in the US are now very attractive. 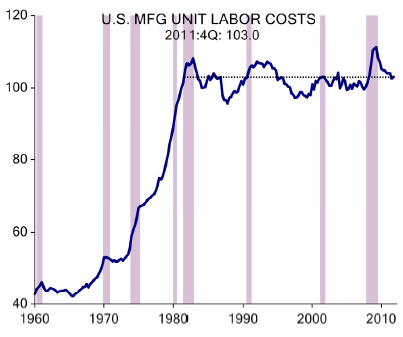 In particular US manufacturing unit labor costs have not grown since the early 80s when Volcker brought inflation under control. From 1960 to 1980 the compensation levels for US manufacturers had increased at a rate of 9% per annum, while productivity grew at 2%, rapidly raising unit labor costs. But since the early 80s both compensation and productivity grew at 4%, capping unit labor cost growth. By contrast unit labor costs in Brazil for example are growing at close to 11% a year. But even without the efficiency increases, labor costs for US based manufacturers are now materially lower than in a number of other developed nations. Dollar weakness had played a major role in helping to reduce US compensation cost levels - for example with respect to Canada. WSJ: "Wage and benefit costs at a Caterpillar rail-equipment plant in LaGrange, Ill., are less than half of those at the company's locomotive-assembly plant in London, Ontario, Caterpillar says." You are starting to see more foreign firms opening up or expanding manufacturing facilities in the US (Honda, Siemens, VW, etc.) Other factors are helping make manufacturing in the US more attractive, such as rising shipping costs (due to higher fuel prices) to import goods into the US from Asia. WSJ: Along with more competitive wages, the U.S. is benefiting from cheaper energy costs—mainly because of the shale-gas boom—and a weak dollar, which makes U.S. goods more competitive in export markets, although U.S. producers still face relatively high corporate tax and tough environmental regulations. Meanwhile, some manufacturers are bringing part of their production back to the U.S. from Asia to reduce logistical snarls. One key obstacle to investing in US manufacturing continues to be the US corporate tax system, which is in desperate need of restructuring. If there is progress on that front, the next "offshoring" place may be onshore.